Drug consumption rooms enable drug users to take their own illicitly obtained drugs under clinical supervision in a hygienic environment. The evidence contradicts concerns that such facilities might counterproductively encourage drug use, delay treatment entry, or aggravate problems arising from local drug markets. Benefits may include safer, more hygienic drug use, increased access to health and social services, and reduced public drug use and associated nuisance. Drug consumption rooms enable people to consume their own illicitly-obtained drugs under clinical supervision in a hygienic environment, and have been operating in Europe for the last three decades. They primarily function to reduce the risks of unhygienic injecting, prevent overdose deaths, and link people at high risk with addiction treatment and other health and social services. They also seek to contribute to a reduction in drug use in public places and the presence of discarded injecting equipment. By providing an objective overview of their characteristics, current provision, and evidence of effectiveness, this briefing from the European Union’s drug misuse monitoring centre aims to respond to concerns that drug consumption rooms might counterproductively encourage drug use, delay treatment entry, or aggravate the problems associated with local drug markets. The first drug consumption rooms were set up in Swiss, German and Dutch cities in response to health and public order concerns linked to ‘open drug scenes’. Although set up and supported by a range of local stakeholders, the facilities were experimental in the beginning and sometimes controversial. Subsequently, local service providers, public health authorities and the police carefully monitored the situation before and after the opening of the facilities and documented whether intended changes were achieved. Outcomes were reported directly to local and sometimes national policymakers, and remained relatively inaccessible to the international research community until English language research summaries were published (1 2). In contrast, pilot supervised injecting facilities established in Sydney and Vancouver were accompanied by robust, well-funded, university-based evaluation studies, and resulted in a substantial body of evidence. As of April 2018, there were 31 facilities in 25 cities in the Netherlands, 24 in 15 cities in Germany, five in four cities in Denmark, 13 in seven cities in Spain, two in two cities in Norway, two in two cities in France, one in Luxembourg, and 12 in eight cities in Switzerland map. Irrespective of location, features common to most drug consumption rooms include access requirements such as being registered with the service, meeting the minimum age, and living locally. Usually they operate from separate areas attached to existing facilities for people who are homeless or who use drugs, though some are stand-alone units. Most target people who inject, though they are increasingly catering for people who smoke or inhale drugs. The vast majority of services are integrated in ‘low-threshold’ facilities which also offer food, showers and clothing to those who live on the streets, condoms and sharps containers, and counselling and drug treatment. In contrast, specialised consumption rooms only offer the narrower range of services directly related to supervised consumption, which includes the provision of hygienic injecting materials, advice on health and safer drug use, intervention in case of emergencies, and a space where drug users can remain under observation after taking their drugs. Mobile facilities in Barcelona and Berlin provide a more geographically-flexible deployment of the service, but typically cater for a more limited number of clients. Based on evaluation studies, the benefits of providing supervised drug consumption facilities may include improvements in safer and more hygienic drug use (especially among regular clients), increased access to health and social services, and reduced public drug use and associated nuisance. There is no evidence that the availability of safer injecting facilities increases drug use or frequency of injecting or results in higher rates of local drug-related crime, and rather than delaying treatment entry these services are associated with facilitating treatment. The widely documented ability of drug consumption facilities to reach and stay in contact with highly marginalised target populations has resulted in immediate improvements in hygiene and safer use for clients, as well as wider health and public order benefits. Use of supervised drug consumption facilities is associated with self-reported reductions in risky injecting practices such as sharing syringes, thereby reducing behaviours that increase the risks of overdose deaths and of transmitting blood-borne diseases. However, the impact of drug consumption rooms on the reduction of HIV or hepatitis C among the wider population of injecting drug users remains unclear and hard to estimate, due in part to the facilities’ limited coverage of the target population and methodological problems with isolating their effects from those of other interventions. Evaluation studies have found an overall positive impact on local communities, including a decrease in public injecting and a reduction in the number of syringes discarded in the vicinity. In Barcelona, for example, a fourfold reduction was reported in the number of unsafely disposed syringes being collected in the vicinity of safer injecting facilities from a monthly average of over 13,000 in 2004 before they opened to around 3,000 in 2012 after they opened. In areas reporting an increase in the number of people smoking and inhaling drugs such as crack cocaine, drug consumption facilities that originally targeted only injectors have started to broaden their services. Such changes in service provision are taking place in the context of a decrease in the prevalence of heroin injecting and an increase in access to opioid substitution treatment. In a number of European countries, supervised consumption has become an integrated component of low-threshold services offered within drug treatment systems. In Switzerland and Spain some drug consumption rooms have been closed, primarily due to the reduction in injecting heroin use and a decline in the need for such services, but also sometimes due to cost considerations. In Greece the operation of the facility was suspended after the first nine months due to delays in establishing a legal basis, and at the time of publication, the service provider was working with the Ministry of Health to prepare its re-opening. In the Netherlands, cutbacks were made following a reduction in the number of visitors linked to the success of another programme that brought homeless people into supervised accommodation where the use of drugs was often allowed. 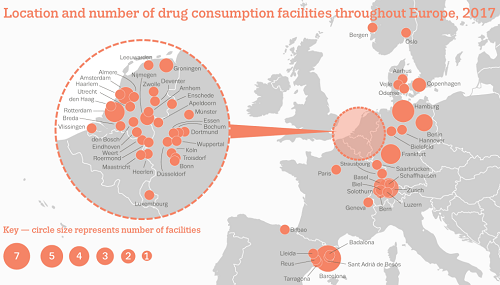 Alcohol consumption rooms, which tend to be located in the same building but in separate rooms, are also increasingly being combined with drug consumption facilities in the Netherlands. Drug consumption rooms have the ability to reach and maintain contact with high-risk drug users who are not ready or willing to stop using drugs. The evidence base contradicts concerns that such facilities encourage drug use, delay treatment entry, or aggravate problems arising from local drug markets – finding instead that both the users and the community stand to benefit. As frontline, low-threshold services, drug consumption rooms are often among the first to gain insights into new drug use patterns and thus they also have a role to play in the early identification of new and emerging trends among the high-risk populations using their services. The emergence of new forms of injectable stimulants, including new psychoactive substances, have resulted in potentially increased risks for drug users, and this is part of the context for the political discussion in some European countries about the introduction of drug consumption rooms. commentary This clear and concise presentation of the evidence suggests that the benefits of drug consumption rooms “may include improvements in safe, hygienic drug use, especially among regular clients, increased access to health and social services, and reduced public drug use and associated nuisance”. Elsewhere, the European Union’s drug misuse monitoring centre has framed the quality of evidence as moderate, supporting the conclusion that drug consumption rooms “are likely to be useful in the context in which they have been evaluated but further evaluations are recommended”. Though it remains difficult to evaluate the impact of drug consumption rooms in a way that meets the scientific ‘gold standard’ of a randomised controlled trialThe randomised controlled trial randomly assigns participants to an intervention versus an alternative intervention or no intervention at all. Researchers investigating drug consumption rooms largely undertake evaluations in real-world settings, in which the effects of drug consumption rooms are obscured by a complex set of factors not under their control., the 2006 UK Independent Working Group on Drug Consumption Rooms concluded that “the methodological problems involved here should not detract from [drug consumption rooms’] considerable success”. On balance, the evidence suggests that drug consumption rooms can have a positive impact on the health of their clients, for example through ensuring (relatively) safe and hygienic injecting in the facility, providing personalised advice and information on safe injecting practices, recognising and responding to emergencies, and providing access to a range of other on-site and off-site interventions and support. And, even without a randomised trial, it may be possible to at least estimate the likelihood that an intervention (in this case, a drug consumption room) is having a positive or negative impact. For instance, it may not be possible to determine impacts on the transmission of infectious diseases, but it is possible to observe impacts on self-reported needle and syringe sharing – the main cause of transmission among drug users. There are currently no drug consumption rooms in the UK, despite concerns over the harm caused by public injecting, and concerns that the needs of the target group of drug consumption rooms are continuing not to be met by existing services. However, according to recent statements from the Home Office and Prime Minister the UK Government has “no intention” (1 2) and “no plans” of introducing safer injecting facilities. For a discussion of whether it is time for safer injecting spaces in Britain, see the Effectiveness Bank hot topic dedicated to the issue.